Populus fremontii is a tree for a very large garden or pasture. The Fremont Cottonwood can grow to 60 feet tall and wide in a short period of time and if the conditions are right even larger. Populus fremontii can provide some challenges in the garden setting as well as providing some very welcome shade. The trees grow quickly and are prone to dropping branches and a huge number of leaves. Populus fremontii blooms in the early Spring and will produce floating cotton looking material in late Spring and Summer. When planted in an area where groundwater is not too deep the trees will rapidly seek out this water and will easily sustain themselves. In areas with no groundwater another tree should be considered. If planted too close to the lawn the Fremont Cottonwood will send in an army of roots often making the lawn quite lumpy. If planted too close to a sidewalk or building the roots are famous for being able to lift things. 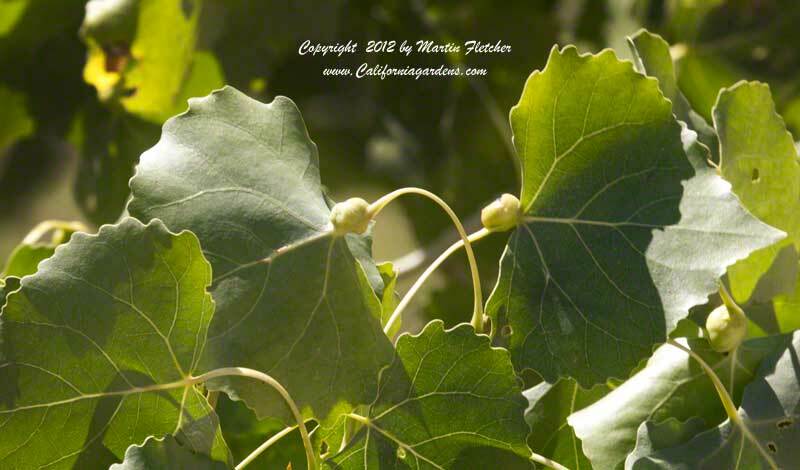 Populus fremontii is a host plant for the Western Tiger Swallowtail and is a great shade tree for the butterfly garden. The lumps on the petioles of these leaves were likely caused by the sting of gall forming aphids. Because of the large leaf area the transpiration and evaporation of that water cools the local environment siginificantly making a seat under a Fremont Cottonwood an attractive place to cool off on a hot day. It is common enough for large branches to come off the Fremont Poplar trees on the hottest days. The trees draw so much water that the branches are at their heaviest on a hot day. Populus fremontii will produce a beautiful show of yellow leaves during the early to mid part of the Fall. Galls on the petioles of leaves of Populus fremontii - Fremont Cottonwood. High resolution photos are part of our garden image collection.